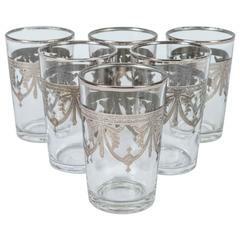 Set of Mid-Century Modern gin tumbler glasses. Glasses have striking ice glass form with ice cube design. Barware set consists of six glasses in contrasting iridescent colors. 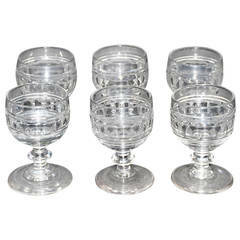 Two glasses are clear, two have a yellow tint, and two have a smoked grey or bluish hues. Makes a wonderful addition to any cocktail set. Great condition with minimal wear consistent with age. 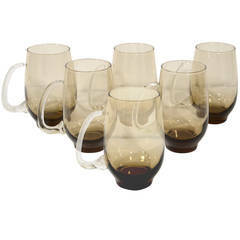 Set of six mid-century barware glasses or beer mugs in blown glass with smokey grey-brown color. Feature stylized clear glass handles with modernist horn design. Set of six vintage Moroccan blue and gold glasses. Moorish design great for mint tea or any drink cold or hot. Multiple sets available, contact us if you need more than six. Set of six Mid-Century Modern Italian glasses. Six vintage bold sixties-style patterned glasses in yellow, red and opaque white. Marked and stamped "Cerve." Italy, circa 1960.